When the great crowd of the Jews learned that he was there, they came, not only on account of Jesus but also to see Laz′arus, whom he had raised from the dead. So the chief priests planned to put Laz′arus also to death, because on account of him many of the Jews were going away and believing in Jesus. This was one week before Jesus’ crucifixion and Jesus was eating with friends, one of whom He had raised from the dead, Lazarus. It is important to note that you can not eat with a ghost or someone who was just raised in spirit. Since Lazarus was raised body and soul, he was able to eat and interact with those around him. Word of Lazarus being raised had spread and many wanted to come and see this miracle. This was incontrovertible proof that Jesus was the Son of God, and even though many came to believe because of this, there were still those who were upset by the attention being taken away from them and continued to plot against Him. In addition to this, the pharisees wanted to kill Lazarus so that the people would not be able to see, touch and interact with him. Pray for those who plot to kill Christians because of Jesus. We will always have those who will hate us because of Jesus, but we must remain strong in our faith and stand up for those who are persecuted. 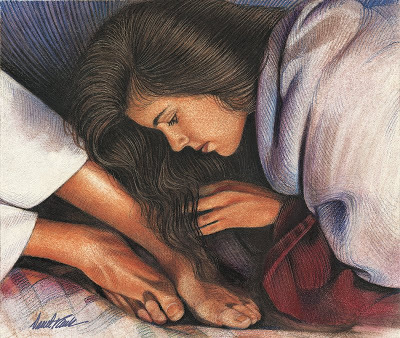 Mary’s expression of love towards Jesus was selfless and beautiful. Mary had come to full faith and love for Jesus, not just for bring her brother back to life, but from listening and coming to know Jesus. She probably also knew or realized that this might be the last time she was going to be able to dine with her Lord. Jesus knew what was in the days ahead, and now witnessing this expression of love towards Him brought Him comfort and peace. Jesus was able to enjoy this enormous (and costly) expression of faith, love, and gratefulness as ‘payment’ for all that He had given to the people around Him. Mary’s gift was so welcomed and beautiful it was written into three of the Gospels (Matthew 26:6-13 and Mark 14:3-9), to always be remembered as a way a faithful servant humbly thanked Jesus for what He had done in her life. It is only in John’s Gospel that we read the love and care that was taken when anointing Jesus. We may feel like worship of Jesus costs us too much time in our busy days and too much money that could be used on other things. We’d rather go out with friends Saturday evening, we don’t want to get up early on Sunday mornings, or we choose to sign the kids up for sports where games are scheduled during Sunday mornings. Do not squander the time that we have with Jesus when we dine with Him at Mass or in adoration and prayer. This is a special time each week we can give Him to show how much He means to us. We anoint Him with our prayers and share our blessings with Him by tithing to His Church. We may also feel that donations to the Church could be better used for our personal expenses or other causes we feel are more important. John’s Gospel is the only one where we learn that it was Judas Iscariot who complained about the money Mary ‘wasted’ on Jesus. Judas used this excuse to cover his true feelings about money, when he stated that money could have been better spent on the poor. Judas, the betrayer, was so focused on money and power that he could not see the beauty and love that was before him. We must not set our focus be on temporal things like money, greed and power. God will provide all that we need to those who love Him. Make a loving sacrifice to Jesus this week by spending extra time with Him in prayer and in adoration. Jesus, I humbly come before You in love and gratitude for all the blessings You have given to me and my family. Allow me to anoint You with my prayers in thankfulness. You are my Lord and Savior, thank you for loving me. In your holy Name. Amen.